Race car scale system consists of (4) weigh platforms with built-in digital weight indicators. Operates on (6) "C" size batteries or AC adapter (included). Each platform is 15" x 15" x 2.6" high. The capacities listed below are per complete scale system. For example the WS-1000-Race consists of (4) 1,000 lb scale platforms, each platform weighs in 1 lb increments. 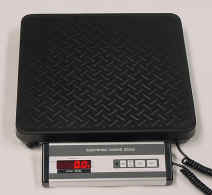 The digital weight indicator comes attached with a mounting bracket but is detachable from the scale platform if necessary.